"Our liberties we prize and our rights we will maintain"
The Iowa state seal identifies government buildings and officials and the eagle and banners are displayed as a centerpiece for the Iowa state flag. The central figure depicts an American soldier in the uniform of the 1800's supporting the swirling American flag topped with a liberty cap with his right hand, and holding his rifle with his left hand. The pileus, or Phrygian cap was said to be worn in ancient Rome by slaves who had won their freedom. The Mississippi river serves as a backdrop to the seal together with a steamboat. 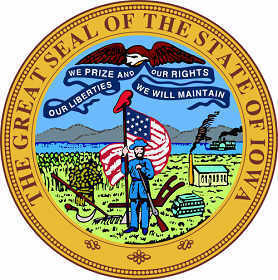 The Iowa seal is kept and used as required by the Constitution and laws of the state. 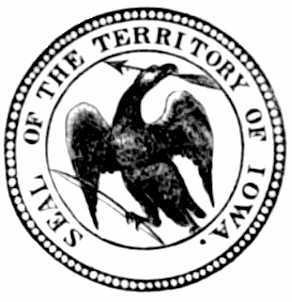 This is an Iowa flyer showing the 1876 design of the seal. The pictures illustrate the important industries in the 1800's.